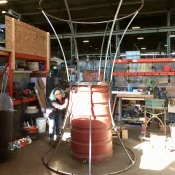 I’m looking for art volunteers to work on a free-standing rainwater harvesting sculpture that will. I’ve got two main tasks. One is working with me or another person to afix existing strings of CDs to the sculpture framework. This has to be done in pairs – one person inside the frame and one person on the outside. (We have about 30 hours of this work, though you don’t have to commit to that much time). The sculpture is in Bay 7 of the American Steel building in West Oakland. The other thing is that we still need at least 100 more strings of CDs. This is super simple and you can even do it at home while watching tv once you’ve been trained. Or you can do it at my house (Oakland/Emeryville) or at my studio in the American Steel building in West Oakland or the Wholly H2O office in downtown Oakland.